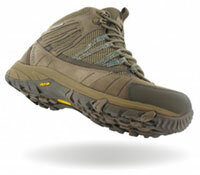 Hi-tec's Harmony mid is a really very attractive looking walking boot in a women specific fit. The ankle cuff and tongue are generously padded as is the inner sole. The Vibram outer sole has good 3mm depth 'lugs' and I found the whole sole unit to be nicely supportive, providing good traction over asphalt, mud, wet grass etc. This is a flexible and very light-weight boot and whilst there's not enough rigidity/ankle support for rocky terrain - on the various low level countryside walks of between 5-7 miles I tried them out on, I found them to be really comfortable. The weather's been reasonably mild and without much rain but I have been through some long, wet grass and my feet have been dry as they were in some light spring showers. I've yet to try them in prolonged and/or heavy rain. Although the lacing system is relatively simple, I did find I was able to fasten the boot so as to ensure my heels were kept well in place. I thought, though, that the fit was a little on the small size - particularly as far as width across the front of the foot is concerned. The Harmony Mid is an attractive-looking, light weight walking boot for warm weather/low level walking. They are certainly light weight enough for more general leisure wear. Check the sizing if you have wider feet.